Not too long ago, on advice from my friend Roger, I decided to start reading Leslie Peltier's autobiographical "Starlight Nights". Here, I must confess that I was only familiar with Peltier in passing. I was aware that he had written a great book on binocular astronomy, and that he was an early member of the AAVSO. Beyond that, the man was a mystery to me. After I finished reading "Astronomy With An Opera-Glass" by Garrett P. Serviss a second (maybe third) time, I went over to this "Starlight Nights", and have been enthralled. More than that, however, is the fact that he has touched upon some truths that I've often considered but never really have given much thought to. The one thing that he stressed is that the best way to learn the night sky is directly, that is to say, by oneself. I suppose to a degree it is akin to that old adage from Benjamin Franklin; "Tell me and I forget, teach me and I may remember, involve me and I learn." The best way to learn the night sky is to simply go out and observe it. The other take away I've gotten from the book so far is that the size of the instrument used to observe the night sky is really less important than the tenacity of the observer. As Serviss' book has demonstrated, something as small as an opera glass is sufficient. The great French astronomer Lucien Rudaux also felt that way. In Peltier's book, he goes into some length about how effective his first telescope, a humble 2" (50mm) terrestrial telescope was. A terrestrial telescope, if you're not familiar with them, has a complicated optic train in order the create an erect image. From personal experience, I've found that the amount of light lost in one is quite high, certainly more so than an equivalent sized astronomical telescope. Yet he was able to view and achieve quite a bit with this instrument. It would be easy to say it was his location, the rural reaches of Ohio, or the time period, the early 20th century, that enabled him to accomplish what he did. Perhaps so. Though I am tempted to say balderdash. I live in an area where, to my south, is the booming metropolis of Jacksonville, Florida. To my northeast are two paper mills that run twenty four hours a day. Nearby is a shopping area, and my own neighborhood has those bothersome sodium streetlights. Yet I have been able to see quite a bit. Certainly, some of the more distant objects are lost. I don't see much in the way of galaxies here, and some of the fainter deep sky objects are all but invisible. But the wonders are there. It just requires tenacity coupled with the act of simply looking. If you've been reading the blog, you know that I've been thinking about "retro-astronomy" a bit. Recently, I decided to read, once more, Garrett Serviss' classic, "Astronomy With An Opera-Glass". My copy is over a century old now, so I find myself alternating between its delicate pages and an ebook version on my Kindle. The way it is written is a sheer delight, a peek at the way popular astronomy was handled at the time, and you can see within its pages how it was evolving. In the last section of the book, Serviss deals with the Moon, the planets, and lastly the Sun. The method that Serviss recommends for observing the Sun is the use of smoked glass over the eyepieces. This is pretty similar to the same method used by astronomers for some time at that point, though of course it wasn't the only one. I could go into many reasons why this is pro and con. Today, of course, one could simply put a solar filter over the objective lenses and be set. What puzzled me, though, was why Serviss didn't recommend solar projection. Admittedly, with low magnification, the image would be small, but if the room where the image was projected was dark enough, the surface onto which the image was projected could be set far enough away so as to present a decent sized image. The problem, though, is one of resolution. I've found that direct observation, by means of a solar filter and a decent sized instrument (even as small as 35mm) is best. For projection, the instrument has to be larger, at least 40mm, to present a clear image. The other concern is the size of the spots that may be on the Sun. Smaller ones will not show up in low resolution projections. The day this was written, 10th July, 2016, the Sun only had three sunspot regions on its surface, and all of them were small. 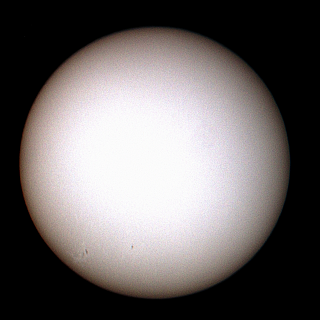 An afocal shot of the Sun taken the morning of 10th July, 2016. Camera was a Kodak C180, telescope a Tasco 50mm 6TE-5 with an 18mm Plossl eyepiece. Processing done in Gimp. Image by the author. This doesn't mean that solar projection with an opera or field glass can't be done, of course. These are merely some of the challenges. I decided to investigate this on my own. The first thing I did was to cobble together a mount on a tripod. For this, I used some corner brackets, a 4" and a 1 1/2" (100mm and 38mm). The larger bracket was bolted to the tripod head with a 1/4"-20 nut, and then the smaller bracket to the larger one, aimed backwards. This would be my main mount. For each instrument used, a different method of attachment was required. This was done with a combination of steel straps, bolts, nuts, and coat hanger wire. The first instrument used, my old Lemaire opera-glass, was fairly straight forward, using just the steel strap and a bolt with a wing nut. This glass has very low magnification, around 3x, so the projected image was expected to be small. For my "screen", a piece of Crescent Board was taped to another tripod head. As expected, the image was small. But it was sharp. It is very likely that larger spots can be seen here (though, of course, the current batch of small regions would not be). The next instrument used was my Airguide 4x40mm field glass. This required both a strap and coat hanger wire. While the objectives in the Airguide are achromats, they are not the best, especially on bright targets. The Sun is, of course, very bright. The Sun's image was so bright, in fact, that it was hard to get a sharp focus. Is it likely that direct observation with a solar filter with this instrument would yield better results? Perhaps. That would be something to test at another time. These tests, though, prove that it was possible to observe the Sun using a different, and safer, method that was available. More than likely, if anyone was to undertake this, it would have been best done either in the morning or at sunset, with the Sun at a ow angle, and projecting the image into a darkened room at a distance. More importantly, however is that it could be done. Perhaps, soon, I'll attempt to try that method. For now, it is enough to know that it could have worked. In 2004, during my first visit to the Wolf's Head Bookstore in St. Augustine, Florida, following my return to the state, I picked up a classic book by Garrett P. Serviss, "Astronomy With An Opera-Glass". This was an older edition, from 1910, making it now over a century old. It is still in great shape, and was then, but because it had been a library book, the price was low. Anyway, it is a wonderful book, one of the first really written for the average person using tools that were easily available, an opera glass. The author suggested that the reader obtain at least a 1 1/2", 4x power pair. As it turned out, these were somewhat common, though not particularly inexpensive at the time the book was originally written (1888). I set the book into my astronomy shelf at the time, and considered it something of a curiosity more than anything else. Not quite a year later, I chanced upon a Lemaire Fabt. opera glass at a community yard sale. It was only a couple of dollars, so it came home with me. The book came back off the shelf. Since that time, I have been interested in the way the night sky was enjoyed in previous eras, and especially with earlier instruments. The opera glass, and its brethren, have allowed many thousands of people to view the night sky without the heavier commitment of a telescope. After all, you could always go back to using them for other things, whereas a telescope is a bit more specialized. But it wasn't enough for me to be interested, I wanted to have the experience as well. The opera glass I bought at the yard sale was a little smaller than the ones that Serviss recommended. A short time later, I found a pair of Tasco mini binoculars that were really not modern binoculars at all, but field glasses. Like the smaller Lemaire opera glass, these consisted of two objective lenses and two simple concave negative lenses for eyepieces, effectively Galilean. Aside from size, the modern Tasco pair had another advantage, in that the objective lenses were true achromats, not the simple single convex lens of the older Lemaire opera glass. That didn't prevent the Tasco from being useful for getting an idea of what Serviss wrote about a century before. My first night with them provided me with views of the Hyades, the stars that make up the head of Taurus, or a faint view of the milkiness of the Great Orion Nebula. However, this was still not an honest experience. The objective lenses in the Tasco were coated optics, something relatively unknown at the time. Even though the objectives were smaller in diameter than what Serviss recommended (30mm, a little less than 1 1/4", versus the 1 1/2" Serviss recommended), the views were probably better. What I needed were some genuine field glasses of the older optic design. A few years back, I found such a pair, from the Chicago based company Airguide. These were 4x40mm, with the old Galilean layout and simple objectives. They are from the 1940's or 50's, but are really not much different from what Serviss wrote about. What can you see through these? Galilean optics, by their nature, have a narrower field of view, and that's the case with all three of the instruments, but especially so with the Airguide. Nonetheless, the views were precisely what he wrote about, accounting for some light pollution. I've written about this before here, how I've been into "retro-astronomy". It isn't something I suspect that everyone will be into, but it is a learning, and indeed, a humbling, experience. That they were able to accomplish so much with the simple tools they had at their disposal says much about their determination. Astronomy has evolved, and we take so much for granted today. Even some of the instruments we deride as garbage were better than what they had to work with many times. That's what this taught me, and it helped me to be a better astronomer as a result. Back in late 2008, when I built my "facsimile" Galilean telescope, I was amazed... no, make that appalled... at how poor the optic design was. Yet, this was remarkably similar to one of Galileo's telescopes that still exists to this day, in fact better. Was I able to replicate some of his findings? Of course, but the simple fact is telescopes from that very early period were tremendously lacking. Which brings me to my current work in studying early telescopic sunspot observations. 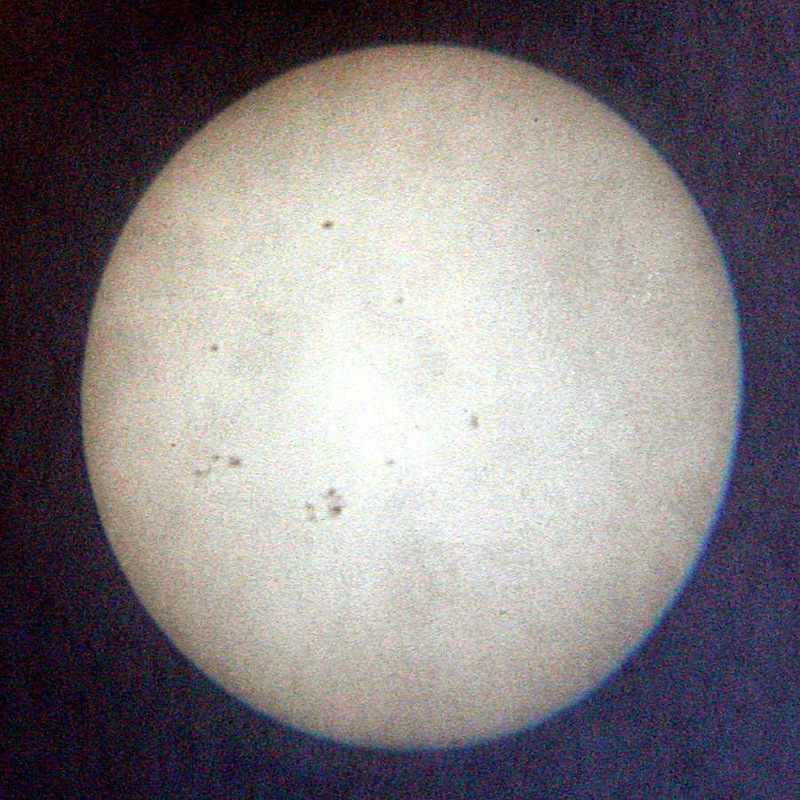 So far, it appears a typical 17th century telescope has difficulty in finding any small sunspots at all. For instance, yesterday the only sunspot groups that were visible through my regular solar telescope "Beatrix" were AR2259 and AR2261. The former group not only had the larger count (eight), but also the larger spots, whilst the latter was only represented by one, small, visible spot. "Christoph", my research telescope (50mm f/20, stopped to 25mm thus making it f/40) could only reveal AR2259, and just its two largest components. AR2261 simply was not there. In both configurations, Galilean and Keplerian, When my Galileoscope, the control for this project (50mm f/10, likewise stopped to 25mm, f/20) was mounted in the helioscope, the view greatly improved, though was still a bit lacking. Again, only AR2259 was visible, as were its two larger components. However, not only was the image far sharper, the smaller spots within that groups were on the edge of visibility, as was AR2261, and that in both configurations. 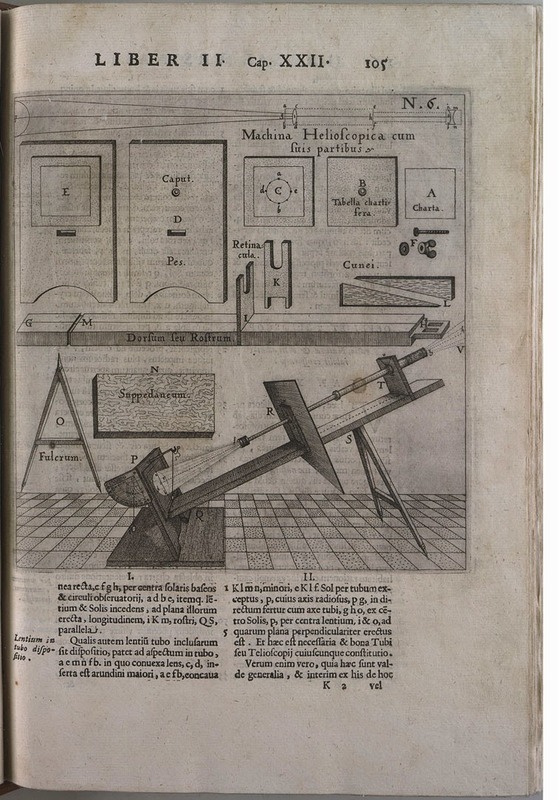 While I know that many serious amateur astronomers tend to deride the Galileoscope and other smaller instruments as either teaching tools only or mere toys, the fact is that they were far superior to what was available to average astronomers for almost two centuries. These are far from mere toys when properly used. My interests in the very early history of solar astronomy has been documented on these pages before. I wanted to explore some more, so I set out to replicate the early solar telescope designs of Christoph Scheiner. While many of his theories about cosmology were wrong (he was an ardent supporter of the geocentric model that the Catholic Church at the time held as dogma), and he was initially wrong about sunspots, he did produce the first practical solar telescope. He called it "machina helioscopica". The design went through two iterations, as found in the pages of Scheiner's work "Rosa Ursina". 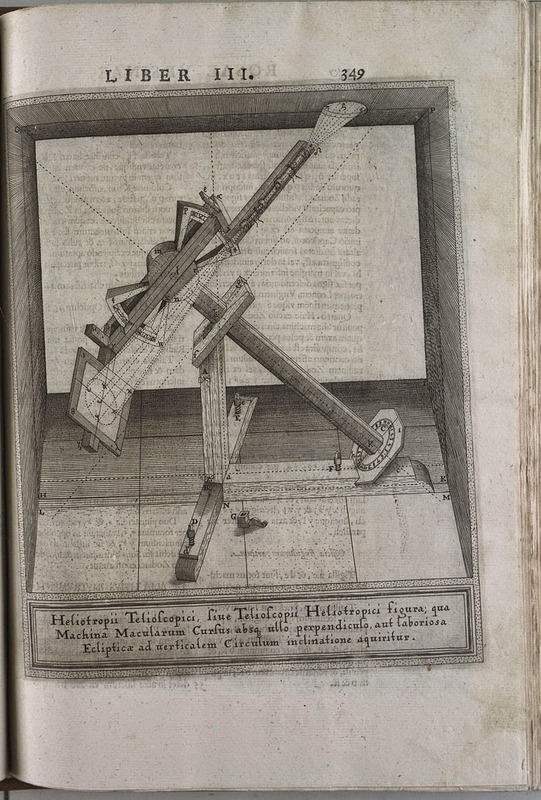 The initial design simply had the helioscope supported by two legs. Later, he improved the design, making in the process one of the first equatorial mounts. Common to both is how the telescope and screen are joined in unison, a backbone of sorts. This technique is still in use to this day for solar studies, namely sunspot counts. I set out to make an improved version over my experiments in 2013. This will ultimately lead to a permanent setup, akin to his later design. For now, the setup will be like his earlier design. I used a piece of lumber, a 1"x4"x60" (25mm x 100mm x 1.524 meters) as the backbone. My initial setup was with cardboard, a proof of concept, to see how the entire design would work. Both telescopes worked well. There were concerns about the Tasco telescope, however. When first used, the images were a little dark. However, when used again, the images seem to work better, definitely more contrast. Incidentally, these images do not do these images justice. Initial Tasco zoom telescope image, with levels adjusted. This is how it appears to the eye. The image processed a little further to bring out details. The positions for all the components were worked out. For instance, I discovered that I needed the projection screen closer, as I planned to use a smaller one, for projection of a 100 to 125mm solar disk. Once all of the positions were determined, work on the improved helioscope began in earnest. This mount would be designed to hold the telescope in two methods; either with a 1/4"-20 bolt, or a hose clamp. To make that mount, two 4" (100mm) "L" brackets were bolted together to form a "U" bracket. This bracket was then attached to the helioscope backbone with screws. Once in place, pieces of self adhesive foam rubber were attached to the mounting surface, to protect the telescopes. The hose clamp would also be likewise covered over most of its inner surface with the rubber foam, allowing space for adjustments. For the forward mask, I used a piece of 18" x 14" (45cm x 35cm) Corroplast sign material, cut in half to make two 9" x 14" (22.5cm x 35cm) pieces. A 2" (50mm) opening was cut in the center of the mask. As designed, the helioscope will mount the Tasco perfectly. Once satisfied, the mask was attached with smaller "L" brackets. Once the mask was in place, it was necessary to test the distances again to the projection screen. While the design was built around the Tasco zoom telescope, I felt it necessary to test the distance with other telescopes. To that end, the Galileoscope was used, sans its forward dew/glare shield. I was reticent to do so, knowing how the Galileo's 20mm Plossl was damaged the last time it was used for solar projection. While it didn't line up perfectly with the opening (it is a larger diameter), it did provide the necessary information. For the projection screen, I chose a small clipboard. To mount it to the backbone, I used another 4"/100mm "L" bracket. While the bolt head does look like it would interfere, for the sized paper that will be used on this design, it really isn't a problem. With the clipboard mounted, the backbone was completed. As luck would have it, when it came time to test the design, the weather turned fickle. However, initial tests with the Tasco telescope proved satisfactory. The images it produced were again fairly sharp, especially when set to 40x magnification. The problem is that the Tasco has a far more complex optic train than Scheiner would have used. It is a terrestrial telescope with a number of elements between the objective lens and the eyepiece. Scheiner would have used a Keplerian telescope with a very simple optic train, just two convex lenses, in fact. While I currently lack Keplerian eyepieces of the correct focal length, the Galileoscope with its 20mm Plossl is sufficient. Eventually, this design will be setup with a permanent host telescope, no doubt on an equatorial similar to Scheiner's later design. In the meantime, I can use this setup for investigations into those early methods, which laid out the path that we follow to this day. In short, it worked. And still does. The Galileoscope has been with us now for five years. Some in the amateur astronomy community have embraced the small 50mm telescope, while others still view it as an educational tool only, and only a mediocre telescope at best. Personally speaking, I sort of belong to both groups, having found that the telescope has plenty of use, but far from mediocre. I have used my telescope for a number of projects, and have even extended its use. In that time, I have learned the following. 1. Other eyepieces - Since the Galileoscope uses the standard 1 1/4" diameter, other eyepieces can be used. Caveat: weight. Since the eyepieces are simply a friction fit, it is crucial to limit weight. 2. Diagonals - Not exactly. You can use a diagonal if you use a Barlow ahead of the diagonal. Again, the problem is weight. While I converted a commercial eyepiece by adding a 29mm plano concave lens, this isn't always practical. The Galileoscope could of course be modified by shortening it up, but this is probably more trouble than it is worth. Best avoided. 3. Barlows - Yes. The Galileoscope already comes with a simple Barlow, and other commercial units can be used. In the image, a small inexpensive (and lightweight) Meade 2x Barlow is being used. Again, the biggest problem is weight. 4. Solar work - Certainly. While I caution users about problems with the projection method, others have reported success. My preferred method is with a solar filter. 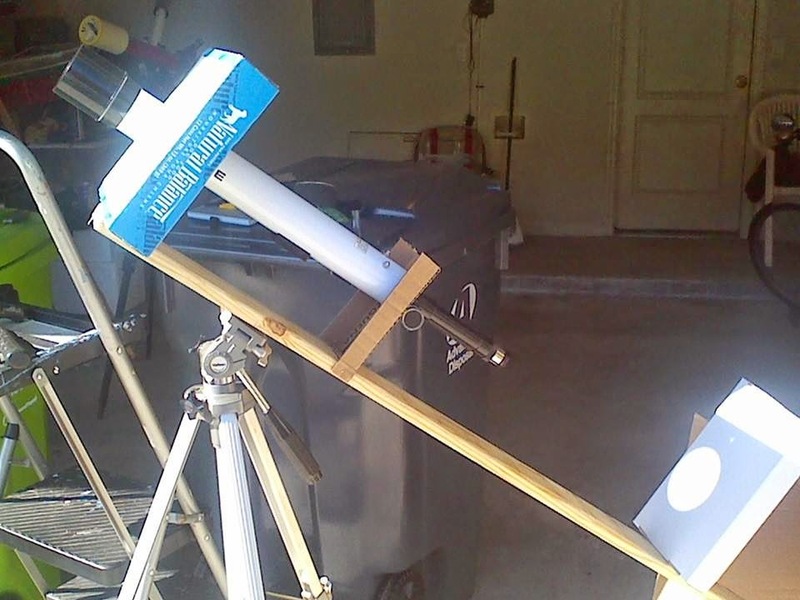 Baader film is inexpensive, and it is easy to build a solar filter. 5. 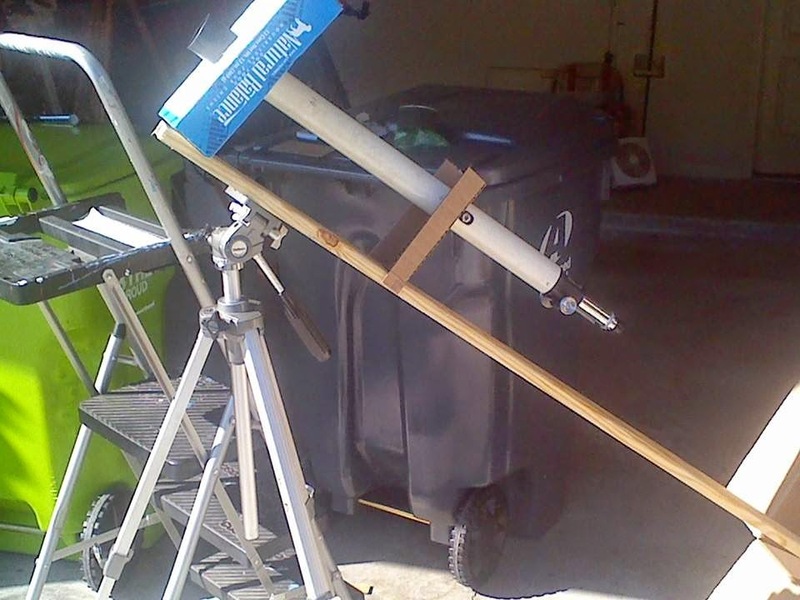 Tripod and other mounting systems - The Galileoscope works best as a straight through, traditional telescope. Depending upon what you plan on viewing, you could find yourself being contorted into some extremely odd angles. When it comes to tripods, the taller, the better with the Galileoscope. Using a chair to effectively sit under the telescope is recommended. A tripod will probably be the single most expensive purchase you could make in conjunction with this telescope. Certainly, there are probably other ways you could mount this telescope, depending upon how imaginative the user is. There are still plenty of projects planned for my Galileoscope. As the top image shows, recently, it was used in alongside my main sunspot telescope, a Monolux 60mm f/7.5 I call "Bianca", and it performed flawlessly. Who knows, I may one day use it for a Messier hunt. As an experimenter's telescope, I believe that it is without peer for its small size.